NEW YORK, Apr 15 (APP):The speaker of the US House of Representatives has asked officials to review security measures intended to protect newly-elected Muslim Congresswoman Ilhan Omar after President Donald Trump tweeted a video attacking Ms. Omar using images of the Sept. 11, 2001, terrorist attacks. After Ms. Pelosi released her statement, a spokesman for Ms. Omar, Jeremy Slevin, said, “Our office has seen an increase in direct threats on (Congresswoman) Omar’s life — many directly referencing the president’s video.” He said Ms. Omar’s office has collected a series of menacing tweets over the last few days, some accusing her of treason. The footage promoted by Trump intercut images of the World Trade Center aflame with comments from Ms. Omar, one of the first Muslim women elected to Congress, about the treatment of Muslims after Sept. 11, The New York Times noted. Conservatives have seized on those remarks as dismissive of the attacks. Sarah Huckabee Sanders, the White House press secretary, said Trump was not inciting violence against Ms. Omar, or Muslims in general, and would not be ashamed for “speaking out against” violence. She added that Democrats should be “taking the same hard line that the president is” against Ms. Omar. Ms. Omar, appearing at an event in Los Angeles last month sponsored by the Council on American-Islamic Relations, a Muslim advocacy organization, suggested that government officials infringed upon the free-speech rights of some Muslim Americans after the Sept. 11 attacks. 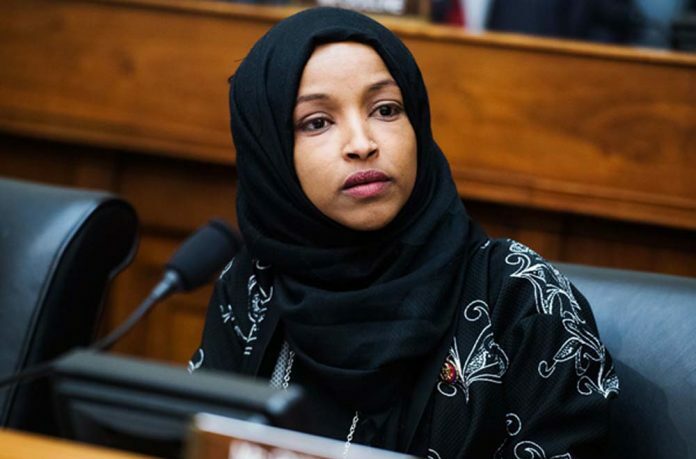 Ms. Pelosi, who is traveling in Europe during the congressional recess, has tried to contact Ms. Omar, but her travel schedule has made it hard for the two to connect, the Times said, citing a Democratic. The speaker criticized Mr. Trump in a series of early-morning tweets on Sunday from Germany, where she was visiting with United States service members. Senator Kamala Harris, Democrat of California, said Trump’s actions were another reminder of how important it was to unseat him in 2020.